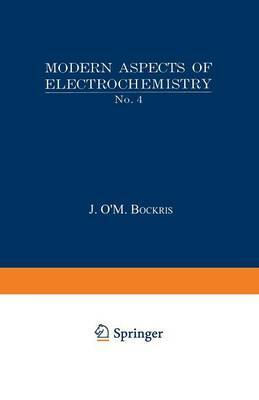 The fourth volume of Modern Aspects of Electrochemistry is being prepared at a time of great growth of interest in electro- chemistry. The situation can be summarized by saying that the realization is spreading among scientists that electrochemistry represents a broad interdisciplinary field, which has applications to many areas in physics, chemistry, metallurgy, and biology. Among the reasons for this awakening is the reorientation of what is understood under electrochemistry toward electrodics- "the study of charged interfaces"-with the ionic-solution aspects of electrochemistry being regarded increasingly as aspects of physical chemistry which are helpful auxiliaries to the broad subject of charged interfaces. The pervasiveness of electrochemistry be- comes clearer when one recalls that most interfaces carry a charge, or undergo local charge transfers, even though they are not con- nected with a source of power. A further reason for the rapid increase in electrochemical studies arises from the technological aspects, in particular in energy conversion and storage, syntheses, extractions, devices, the stability and finishing of surfaces, the treatment of water, etc. The fact that electrodics allows the conversion of chemical to electric energy and the storage of the latter, at the same time producing fresh water as a by-product, presents an aspect of the subject which appears to have far-reaching significance.